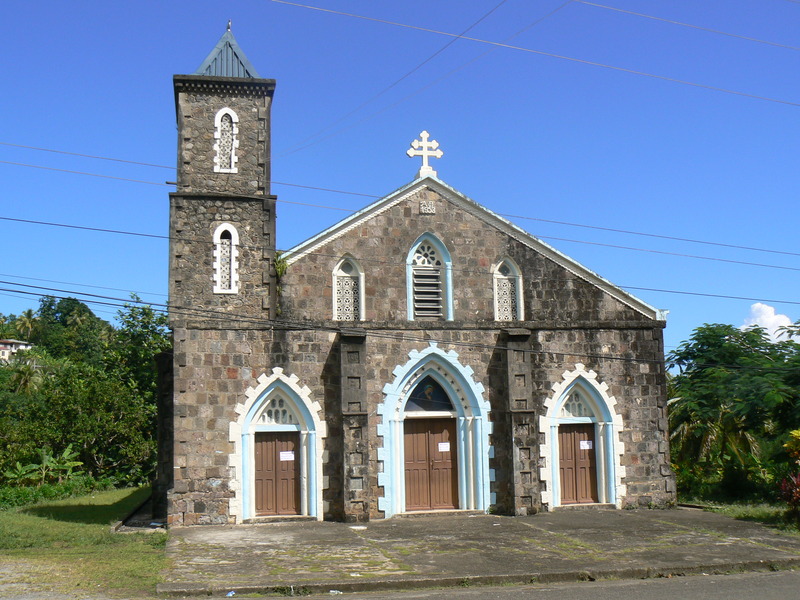 In February 1872 the Sons of Mary Immaculate, or Fathers of Chavagnes, arrived in Dominica. Bishop Poirier undertook, at the age of 72, the long and tiresome ride to the windward side of the island in order to install the french Fathers in their respective parishes. Having first visited La Plaine and La Roche, he rode as far north as Castle Bruce, where he was received with manifestations of unbounded joy. He asked the faithful to restore their chapel and build a presbytery if they wished to have regular Holy Mass in their hamlet; until those buildings were erected they would have to go to St. Sauveur for Holy Mass. Many years passed and nothing seems to have been done : in 1927 regret is expressed that a church has not been built in Castle Bruce and that the parishioners have to cross two, sometime swollen, rivers to attend Holy Mass at San Sauveur. 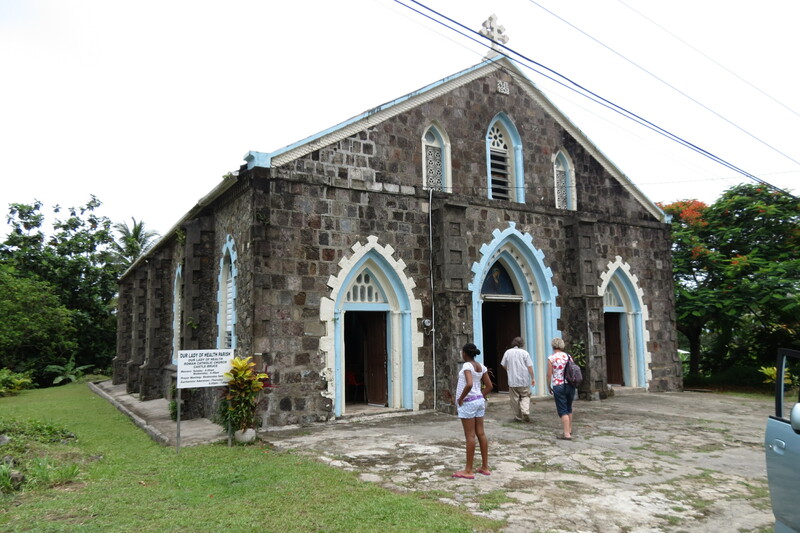 Bishop James Moris, sixth Bishop of Roseau (1922- 1957) , saw the great need for a church in Castle Bruce and obtained from Mrs. Johnson, the owner of the Castle Bruce Estate, 4 acres of land for this purpose. In 1940 he mentioned that the faithful of Castle Bruce, over 700 in number, are gathering native lumber, in order to build a large chapel . It took however the arrival of Fr. Pascal Vrignaud FMI to make this longtime dream come true. On August 12, 1952 Bishop Antoon Demets C.Ss.R. , Coadjutor Bishop of Roseau (1946-1954), blessed the corner stone of the new church at Castle Bruce. It was a grand occasion . The stones for the church came from the ruins of the old sugar factory of the Castle Bruce estate. Fr. Pascal got permission from the owner to remove and use them (source : Dr. Lennox Honychurch). As Fr. Pascal’s health failed him and he left to recuperate in France it became the task of Fr. Hilaire Maupetit FMI to complete the church. The Parish of Our Lady, Health of the sick was canonically erected on February 2, 1954 by Bishop James Moris C.Ss.R, extending from the Pagua River to the Castle Bruce River , including, beyond the Castle Bruce River, the hamlets of Dix Pas and Tranto. This large area was before a part of the Parish of St. Saviour (which was canonically erected on February 8, 1866 by Bishop Poirier C.M.). By July 1954 the parish church of Our Lady of Health was almost completed. The doors & windows and interior fixtures were installed at a later date by Fr. Hilaire Maupetit FMI, Fr. Pascal’s successor. The church, surmounted by a graceful tower, became the pride of the people of Castle Bruce. Fr. 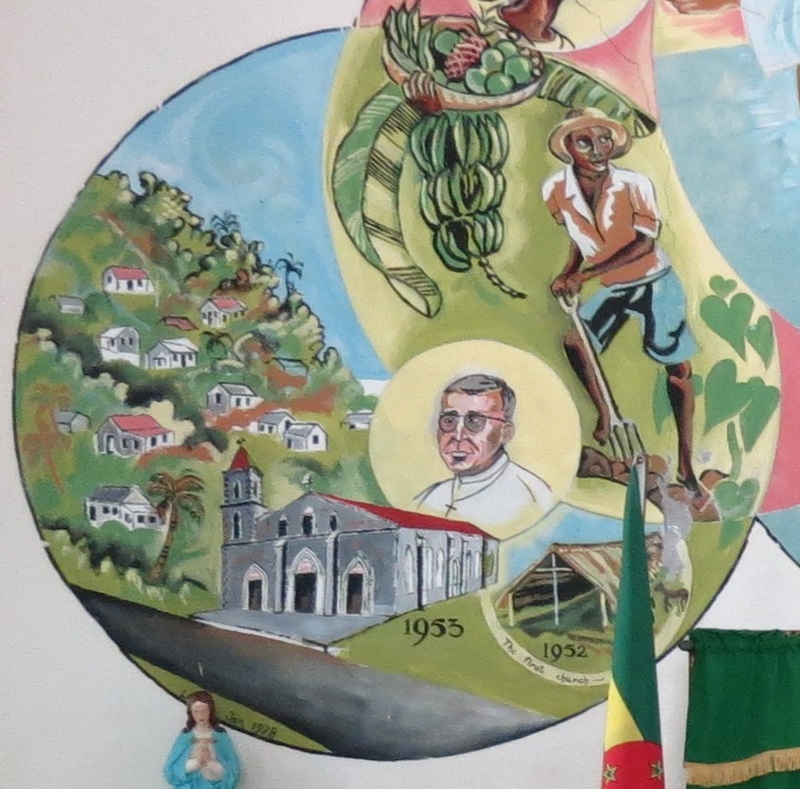 Pascal Vrignaud returned to Castle Bruce and was living there in 1978 when Dr. Lennox Honychurch painted the mural behind the altar. Father Pascal sat for his own portrait. Another important event in the history of this parish church was the extensive damage caused at 3 p.m. on November 29, 2007 by an earthquake. The 2007 Martinique earthquake took place underneath the Martinique Passage and had a magnitude of 7.4 on the Richter Scale. Damage was located in three areas of this beautiful historical building: the tower, the sanctuary walls including the mural and the pointed arched windows. The church was declared unsafe and the community had services in the Government Primary School for several months. The damage to the church amounted to more than EC $ 200,000.00. As the building was under- insured the pay-out from the insurance was insufficient to do all necessary repairs and reconstruction. For public safety reasons, the bell tower, cracked from top to bottom, was demolished in February and March 2008 to avoid danger to the public. The bell named PASCALINA MARIA was stored away for future use. 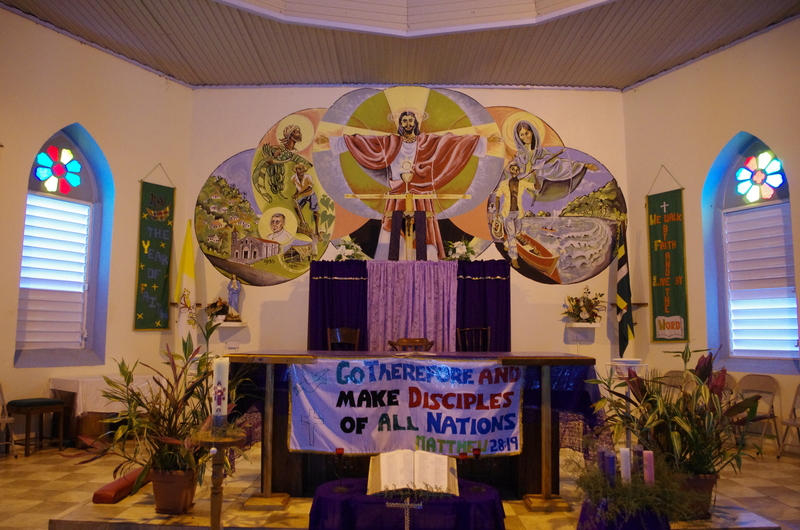 The parishioners moved back into their church on Palm Sunday the 16th of March 2008 although the windows still had to be replaced and repaired. This was done during the months of June- July 2008. The building was also completely rewired and repainted. Today, almost 10 years after the November 2007 earthquake, the present parish priest Fr. Godfrey Tarimo is constructing a new tower, which will house the old bell. This entry was posted in Castle Bruce church, OLD CHURCHES and CHAPELS, Our Lady of Health church, RENOVATED CHURCHES and tagged Castle Bruce church, Our Lady of Health church on July 21, 2017 by Bernard Lauwyck.